The Katahanda Media Foundation which had introduced many compeers to the nation celebrated its 14th anniversary by launching a western dancing academy. Katahanda is the brainchild of popular media personality Srimath Indrajith Liyanage. He is the Course director of the event. Participants will be able to excel in jive, cha cha, samba, rumba, waltz, salsa and other forms of western dancing at the academy. 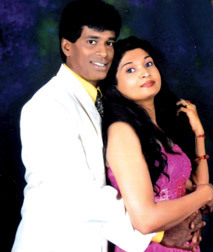 Popular dance guru Chandima Siriwardena and Nalinda Subasinghe are in charge of these classes. Dancer Damayanthi Weerawardena is the Managing Director of the project. Jayasekara Aponsu's 'Sako Deva' will be staged at Kularathna Hall, Ananda College on October 14 at 3.30 and 6.30 pm. It analyzes where the social deterioration had initiated.